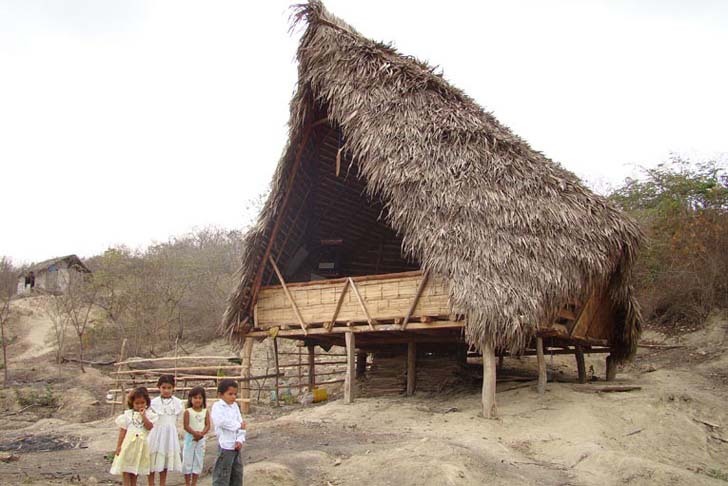 Located on the sand just a few steps away from the Pacific Ocean, Escuela Nueva Esperanza (New Hope School) is a newly constructed sustainable building made from low-impact plant-based materials. Kids and adults in the fishing village of Puerto Cabuyal in Ecuador are very proud of their new boat-shaped shelter, which provides a great learning space that follows active-schools principles. 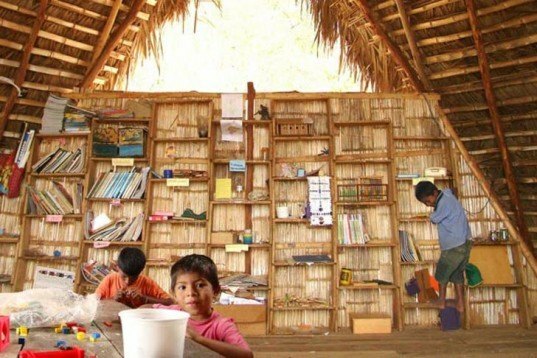 Built by al bordE Architects, David Barragán and Pascual Gangotena, Escuela Nueva Esperanza brings the hope of a more sustainable future to this little village. Active-schools facilitate the development of healthy children by fostering social and physical environments that support free and imaginative learning. From the conceptualization of the space to the actual outcome, this school is a place for education that encourages learning through action. Instead of an over controlled learning environment —think dull concrete box buildings with few windows— Escuela Nueva Esperanza is very closely linked to its luscious natural context, through materials and space. Boasting a fantastic palm wood library full of books and toys, the creative environment is one that kids love to be in. A timber deck resting on foundation piles, with bamboo walls and a palm wooden structure are topped by a roof made of knitted straw scarf or “cade”, the same plant used for weaving Panama hats. Basically the project uses the same materials and building patterns that the Ecuador fishing community has been using for many years. Al bordE Architects David Barragán and Pascual Gangotena involved kids and adults from Puerto Cabuyal in the design and building of the school. Quoting one proud teacher’s own words, “‘The space is generous in every way, which is why the kids feel freer finding each one their own place in which they are going to develop their activities. The model and the structure transmit a freshness and imaginative environment that has favored the development of artistic and academic activities through the lessons that gives the best teacher ever, nature”. Active-schools facilitate the development of healthy children by fostering social and physical environments that support free and imaginative learning. From the conceptualization of the space to the actual outcome, this school is a place for education that encourages learning through action. Instead of an over controlled learning environment this school is very closely linked to its luscious natural context, through materials and space. Boasting a fantastic palm wood library full of books and toys, the children are happy to learn in a playful creative environment. A timber deck resting on foundation piles, with bamboo walls and a palm wooden structure are topped by roof made of knitted straw scarf. The project uses the same materials and building patterns that the Ecuador fishing community has been using for many years. Al bordE Architects, David Barragán and Pascual Gangotena involved kids and adults from Puerto Cabuyal into the design and building of the school. 'The model and the structure transmit a freshness and imaginative environment that has favored the development of artistic and academic activities through the lessons that gives the best teacher ever, nature".